Our guide to the best bonfire night party entertainment ideas will certainly make a big bang! Many of the venues we work alongside in cities like London or Brighton have no outside space. This doesn’t mean you have to have an empty venue on bonfire night. It’s a date every venue dreads as they just can’t compete with those pesky outdoor displays. At Electric Cabaret Company we say bring in those Bonfire Night fire performers, embrace it and work with it! Here’s how to get more bang for your buck! If November 5th falls on a weekday you can have a fire themed event on the closest weekend and the night itself. You can then attract partygoers who don’t like the cold and the queues at organised displays. You can also draw in revellers (with perhaps the use of a friendly and enthusiastic flyering PR team) as they leave outdoor displays and get ready to celebrate further. From multiple remixes of Katie Perry’s ‘Firework’ to The Prodigy classic ‘Fire Starter’. There is a lot of musical inspiration out there for fire based stage acts. If you’ve got the space, go for that wow factor. Fire Hula Hooping (yes this really is a thing!). The cutest of all the fire acts, fire hooping is literally as it sounds. Multiple customised hula hoops with wicks that burn are hooped around the body and arms. All manner of jaw-dropping combinations are created to beautiful effect. Fire Breathing. Always a favourite and probably one of the oldest fire acts. Dating back to the very start of the production of alcohol in Persia which was used as the first fuel for breathing fire. If you have the height and space anything is possible. ‘Dragon Breaths’ create massive balls of fire high up into the air that will simply stun any audience. The highest ever flame was recorded at 26 feet and 5 inches or 8.05 meters by Antonia Restivo in Las Vegas in 2011 – now that’s one amazing fire breather! Angle Grind spark act. Performers angle grind across metal plates attached to their bodies creating showers of sparks to stunning effect. A modern, cutting-edge act with plenty of attitude. 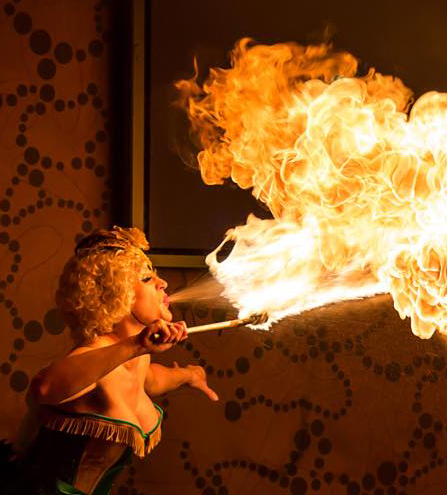 A fire and spark based seated dinner show followed by dancing can be a big pull for events like Gala Balls or Charity Dinners. Carefully picked songs and routines along the theme of fire, fireworks, burning love etc. Besides that you can ntersperse this with high energy fire entertainers to make for a very exciting event. The finale to the night will be a real show stopper if it is combined with specially installed stage based pyrotechnics like cascades. These stunning pyros are designed to shoot upwards or downwards in a beautiful white shower – very glamorous and very high impact for any finale. If you haven’t got much space but want to provide a show-stopping fire filled event on bonfire night, we have got you covered. If you don’t have space the best fire acts would be the ones that involve very small scale fire. Glamorous vintage dancers or Burlesque acts can include fire palms. This is a small lit circular tray of fire in the performer’s hands used to beautiful and graceful effect in a choreographed routine. Body burning and fire eating are exciting acts that involve smaller fire sticks and can be very well contained in a small area. Get your guests involved in the fun with safe indoor sparklers, apple bobbing and cocktails. you can set fire to the Bailey’s Comet, Goblet of Fire (inspired by the Harry Potter Movie), Flaming Lamborghini and the classic Flaming Sambuca. Fire spinning is a wow factor performance and if you have a big enough, safe area outside the entrance to your venue this act can be seen from a very long distance. Therefore it is a great welcome act and photo opportunity for guests. Most importantly, mixing fire performers with drunk party people is always a safety concern. Please don’t book a student who learned to spin fire on a beach in Thailand in his/her gap year. It may all go horribly wrong! Electric Cabaret company performers are all fully insured and experienced entertainers. We can provide a full risk assessment and are confident to work with you regarding fire alarms, clearance space needed between themselves and the audience, security positioning, and locations of lighting pots, fire blankets, and extinguishers. In conclusion, you are in very safe hands with us and remember we are happy to choreograph a bespoke fire show to your chosen track, or drawn from your inspiration from popular culture. Something that is unique to your venue. Finally, we wish you a sparkling, fun-fuelled bonfire night!